Photo courtesy of Mohawk Hudson Land Conservancy. Please follow the Conservancy's visitor guidelines. Updated map of the Winn Preserve here. The Winn Preserve is off Street Road in Knox, between State Route 146 (Township Road) and County Road 252 (Knox Cave Road). It is near the Knox Transfer Station and a cell tower. Look for the cell tower. 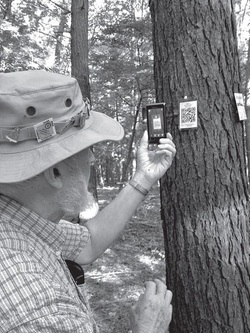 Daniel Driscoll, steward of the Winn Preserve, demonstrates using a smart phone to scan the QR codes found on eight trees in the Hudson and Nancy Winn Preserve in Knox. An app can be downloaded that allows the phone’s camera to scan the code, which will provide a link. Upon touching the link, an audio recording of Driscoll’s voice will stream on your phone, describing the history and geography of the area surrounding that tree. More information at Knox Historical Society. Download the QR Codes here. Read and print the audio tour here. Photo and caption courtesy of The Altamont Enterprise. 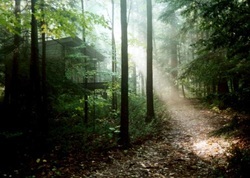 Description: This is a 208-acre wooded property. 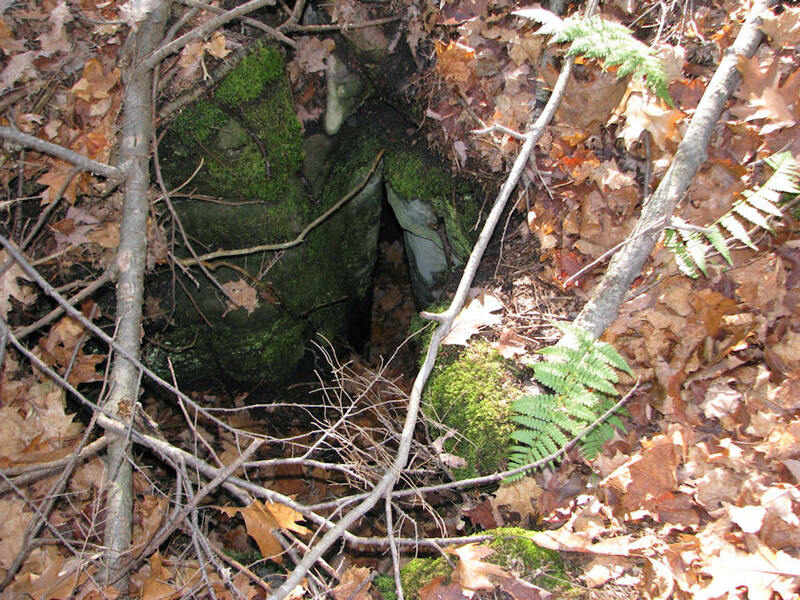 The limestone fissures are perhaps the most striking feature of the property; some of the fissures are 16 inches wide and 20 feet deep. Walk carefully and stay on the trail, particularly when the ground is covered with leaves or snow. The property has an extensive ground cover of Canadian yew, or ground hemlock. Difficulty: Mixed terrain. Some easy, some steep. About three miles of trails. 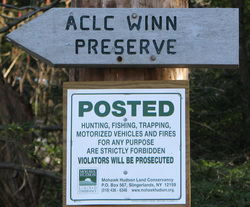 Background: Endowed by Ed and Mary Driscoll This preserve began as a 129 acre gift from Nancy Winn of Slingerlands. Later acquisitions increased its size to 180 acres. The property is along the Helderberg Escarpment and is geologically significant. 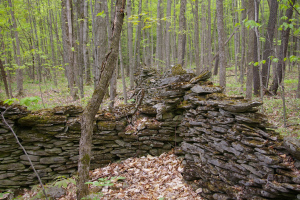 It is partly in the Knox Land Conservation District #2, suitable only for public recreation. The southern boundary of the District is Truax Road (the Green Trail), an old farm-to-market road that is extensively used by hikers and horseback riders. The Town of Knox Transfer Station on Street Road is adjacent to the property to the north, but at a lower elevation. Features: The upper elevations of the property are predominantly creviced limestone bedrock at the surface with very little soil (limestone pavement). The edge of the Helderberg Escarpment runs through the property with extensive rock outcrops and steep cliffs. Below the cliffs the bedrock is Schenectady shale and sandstone. 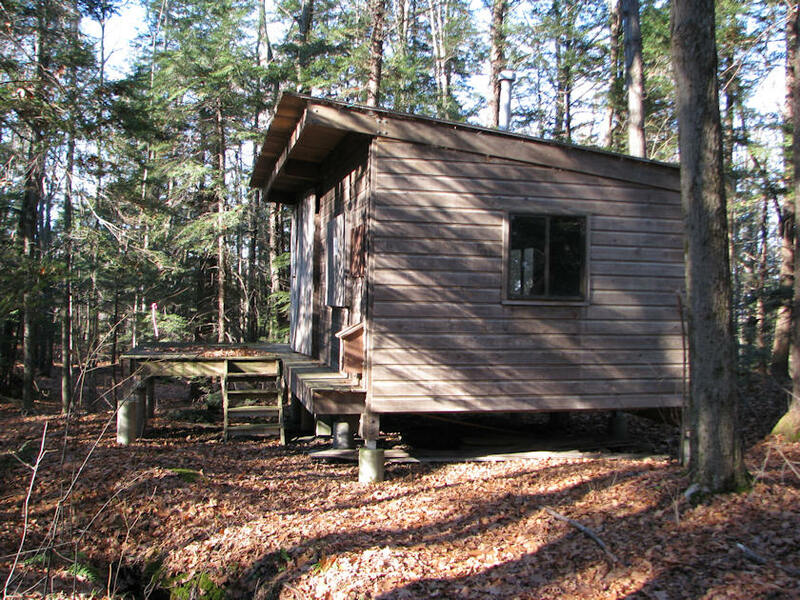 The property contains a well made cabin, built by the Winns. The Conservancy can use the cabin for research and other purposes. The second parking area on Street Road has a large kiosk with information and maps, as well as a sign-in book. The Trails: There are two small parking areas on Street Road. A wide shoulder on Street Road just above (1000 feet to the south-west of) the Knox Transfer Station provides off-street parking. The two trails from the parking area both lead to the Winn Preserve. 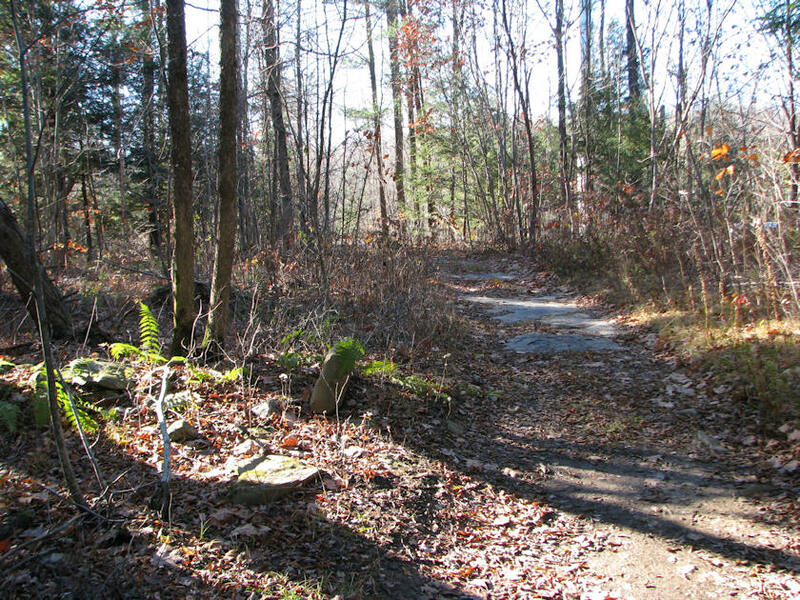 The trail to the east (Truax Road) is the primary entrance to the Preserve. The first 600 feet crosses a small, heavily logged lot owned by the Town of Knox (posted signs remind you to say on the trail). The next 3000 feet of Truax Road leads through the heart of the Preserve and then enters private property.The trail to the south begins at the north-west corner of the Preserve, but only remains on the Preserve for about 1000, then eventually leads to Knox Cave Road. The limestone "pavement" under your feet is hundreds of millions of years old. Given the rocky layer just below the surface, this area was not suitable for farming and was used for wood lots and grazing fields. Old stone walls are still evident. The Blue Trails contains the remnants of an old orchard. The deed notes "limekill fields," indicating that limestone was probably taken from the area for processing in a local lime kiln. More information at the audio tour.